No matter if you are missing several teeth or an entire row, a custom denture can renew the beauty and function of your smile. In order to meet the diverse needs of patients, Dr. Jon Marc Van Slate offers both traditional and implant-supported dentures at his Houston, TX, practice. Both types feature a gum-colored base and artificial teeth. We will review the unique benefits of each denture during a personal consultation to determine the type that can best achieve your goals. Contact our practice today to schedule your appointment. Traditional dentures are secured by clasps, suction, or dental adhesives. These restorations are removable, affordable, and available to virtually all patients with missing teeth. A partial denture is used to replace multiple teeth, while a complete denture is used to replace a full arch. To plan your denture, we will take detailed impressions of your smile. Then, skilled technicians at an advanced off-site lab will use these images to design your custom denture. You may wear a temporary restoration while your permanent denture is being fabricated. 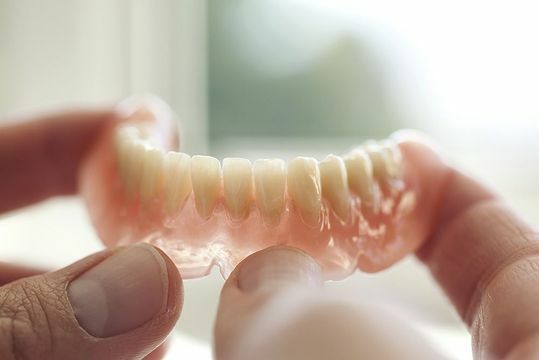 When you return to our office, Dr. Van Slate will have you try on your denture to ensure it fits comfortably and allows for a proper bite. We offer dentures made of a highly durable acrylic that is both comfortable and lifelike. Dr. Van Slate will provide you with detailed instructions about how to care for and maintain your denture. After making any necessary adjustments, you will leave our office with a renewed smile. Dental implants have revolutionized the field of restorative dentistry by allowing patients to experience dentures with an unparalleled level of stability. Implants are small metal posts that are surgically inserted into the jaw to replace missing tooth roots. In order to qualify for an implant-supported denture, your jaw must be healthy enough to secure the implant posts. We can evaluate your candidacy by taking 3-D cone beam scans of your jaw. If we find that your jaw is too weak for implants, a bone grafting procedure may be able to restore necessary strength and help you qualify. Not only will your implant-supported denture never slip or fall out of position, it will also help to prevent bone recession by returning stimulation to your jaw. During implants surgery, Dr. Van Slate will place multiple dental implants into your jaw. As the implants heal over the next four to six months, they will fuse with the jawbone through a process known as osseointegration. Your permanent denture will be created at our partner lab during this time based on detailed impressions. Once osseointegration is complete, you will return to our practice to have your implant-supported denture attached firmly in place. Not only will your implant-supported denture never slip or fall out of position, it will also help to prevent bone recession by returning stimulation to your jaw. Modern dentures allow patients to eat, speak, and smile with renewed confidence. The type of denture that is right for you will depend on your unique needs, goals, and budget. To schedule a dentures consultation with Dr. Van Slate and learn more, reach out to our practice today.